Disneyland is known as the happiest place on earth. With rides and attractions that thrill people of all ages, it is no wonder why. Disneyland has a wealth of options for travelers, providing a magical escape from the real world with wonderful surprises around every corner. People from all walks of life and from all over the world come to Disneyland to experience the wonder. However, for families with four-legged members, this can sometimes be difficult. For some families, leaving pets at home makes perfect sense. Pets can be well maintained during an absence by pet sitters or in kennels or other such temporary pet housing. 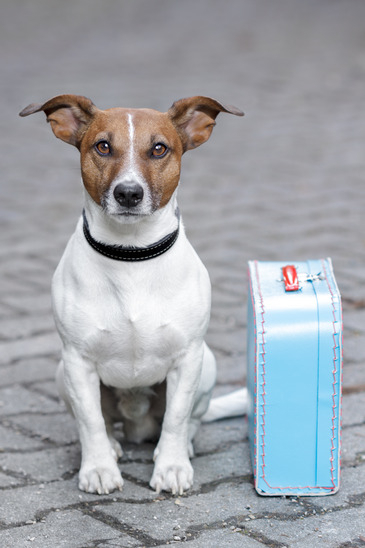 However, while some people may feel comfortable leaving the four-legged family members behind, not everyone can enjoy a trip without furry loved ones in tow. Maybe the pet does not handle separation well or maybe the pet is too integrated into the family to stay behind. In these situations, Disneyland can still be the happiest place on earth. The key is to find accommodations that accept all family members, whether they have two legs or four. While Disneyland itself is not pet-friendly, there are a number of hotels in the area that are very welcoming of pets, making it possible for the entire family to come and enjoy a Disneyland vacation. When considering taking along pets to Disneyland, it is important to know what to look for in hotels. Not all hotels will accommodate pets, so it is critical to always check before booking a room. More than that, not all hotels will have the same policies regarding pets. In some cases, hotels may restrict the type and size of the pet, which may be a factor for families with larger or unusual pets. When booking a room, always make sure that the pet in question will be welcomed upon arrival. From here, pet owners will want to consider the price and location of the hotels, making sure that the rooms fit into the budget and provide satisfactory access to the park. It may also help to consider the other amenities offered by the hotel in order to make the final selection. To get started, consider the following options for the best pet-friendly hotels near Disneyland. 1. Anaheim Marriott Suites. This hotel has a good location in Anaheim, giving guests easy access to the Convention Center, Disneyland and other attractions. It is on a Disneyland shuttle route, making it easy for guests to get to and from the park in a timely fashion. Pets are welcome with an additional surcharge. The hotel also has a pool, hot tub, workout center and more. 2. Sheraton Anaheim Hotel. This upscale selection is on an impressive 13 acres and features a distinctive castle theme. With 500 rooms and a close proximity to Disneyland, the Sheraton Anaheim Hotel attracts guests looking for the inside track at the park. In fact, the Sheraton Anaheim Hotel is part of the Disney Good Neighbor program, and hotel guests who purchase tickets to the park through the hotel can enjoy early admission to the park and other perks. The hotel will accommodate pets, though with all this, the rates can be high. 3. Anaheim Express Inn. It does not get much better than the Anaheim Inn Express. This hotel is conveniently located within walking distance to the park, making it ideal for guests looking for minimal fuss. Pets can be accommodated, and there is also a continental breakfast, an outdoor pool and free outdoor parking for guests. Best of all, rooms at the Anaheim Inn Express start as low as $50 per night, making this hotel the most affordable option for families of all sizes. These three options are just the start. Since Disneyland is such a popular attraction, there is a range of hotels available that welcome pets. All travelers should compare amenities and prices before finalizing a room, ensuring that the facility will offer everything that all members of the family need to enjoy a Disneyland vacation. Disneyland may be the happiest place on earth, but the right pet-friendly hotel in Anaheim can be just as important to ensuring that the trip is perfect for all members of the family. Also available for day use only, the Disneyland Kennel Club is located at the amusement park and welcomes dogs who are older than four months.